Welcome to Dorothy McElhinney Middle School home of the "COLTS"
Students MUST have a student ID card to checkout library books. Student ID cards will be issued at the beginning of the year. Lost cards can be replaced for a $5.00 charge in the student services office. Students may use the library computers before school, during breaks and lunches. Library computers are for school work only. Students need to bring paper to print and/or a flash drive to save their work. Any disk needs to be checked by the librarian for viruses before it can be used in a library computer. An acceptable use policy must be on file for the students to access the internet. Students may check out library books for two weeks and renew books for two more weeks. Lost or damaged books will have to be paid for before students can check out more books. Students are allowed to check out two books at a time. Students will receive an at-home set of textbooks at the beginning of the school year on schedule pickup day. These textbooks are to be kept at home for doing homework. Class sets will be provided in all classrooms. One Search: can search multiple sources, including the collection of library books + databases such as Searchasaurus and Encyclopedia Britannica Online with one easy and time-saving search. Students are able to view a complete list of search results at one glance.Book Covers are visible in catalog. 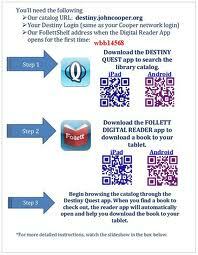 The Destiny Quest Mobile app makes our catalog a touch away from your device. While the interface is more simple than the web-based version, it allows you to search, place holds, view Resource Lists, get citation information, see our most popular titles and see new books as they arrive. We gladly accept donations of new and gently used books. A general purpose resource for all ages. 101 men and women who shaped our world. Over 1,000 illustrations. Now with Lexiles® (880L to 1260L). 700 inspiring stories with 1,500 illustrations of athletes from all sports. Now with Lexiles® (820L to 1210L). Stories of mythological figures from around the world. Biography for Beginners now has a cool read-along feature. Check it out. AND we have added new biographies on the people students like to read about, including Mo’ne Davis, the fabulous Little Leaguer who pitched her way to the cover of Sports Illustrated. New content is added daily.